What happens when you contact iiNet with a problem? After speaking to a friendly customer service representative (CSR) your issue can usually be fixed on the spot. But sometimes the situation is a little more complex than first appears. So some detective work may be required. In some cases – a lot more detective work. In this article, we take you on a journey that reaches from Cape Town to Perth and outback Western Australia, crossing the paths of multiple iiNet departments… leading to a very unexpected outcome. Earlier this year, we got a call from Julie, an iiNet customer for nearly 13 years. Based in Perth, Julie traveled to Onslow on a regular basis but found her mobile phone had no coverage when she got there. Where is Onslow, you ask? It’s a coastal town in the Pilbara region of Western Australia, approximately 1,300km north of Perth. The mobile phone tower in the middle of “snake country”. iiNet’s mobile phone service is based on the Optus’ network and after some initial enquiries, Lisa realised that this query was getting into some interesting territory and required some eyes on the ground. So, her internal enquiries made it to Marcus – iiNet’s Group Mobile Product Manager – who looks after our mobile products as well as managing the coverage in regional and remote areas. The WA Optus network team checked on the Onslow “bird tower” and reported back to Marcus that no alarms had been activated and the site was taking call traffic as per normal. Marcus knew that the bird tower was one of three Optus towers in the area that serviced customers for Optus and iiNet. The other two were at Landsdale and Greenwood. Getting a bit technical, the bird tower was 3G 900 MHz only, meaning that it only supported handsets that used this frequency. For example, newer phones from the last few years would be fine. There were no 2G (older style mobile) or 3G 2100 MHz towers (like what you find in the city) in Onslow, however there were at the Landsdale and Greenwood sites. The plot thickened when network records showed that Landsdale and Greenwood were Julie’s two primary serving towers when she was outside the Onslow area. In other words, the bird tower in Onslow was not providing a service for Julie but it was for others. So if the tower and the eagle’s nest weren’t the issue, what was? Looking at network records, Marcus discovered that Julie was using an iPhone 3GS. A model that was not compatible with the 3G 900 MHz frequency (only with 2G and 3G 850 MHz and 2100 MHz). He also saw that Julie’s previous mobile was an LG GS290 which is a 2G (GSM) only handset. This information cracked the case wide open. Regrettably neither handset was compatible with the Optus 3G network in Onslow. That’s why Julie was getting very poor or no coverage at all. With or without the bird’s nest – the problem lay in the lack of compatibility between Julie’s mobile phone and the servicing towers in the area. So, the only way for any customer in the area to receive signal is to have a mobile phone handset that runs on the 900 MHz 3G frequency. Instead of Julie having to go out and buy a new phone straight away, Marcus suggested that she use a trial handset from iiNet to see what the experience was like. Julie thanked everyone for their help getting to the bottom of her trouble. She’ll be trialing a handset in Onslow soon. In the meantime, the Optus team has done their own digging. 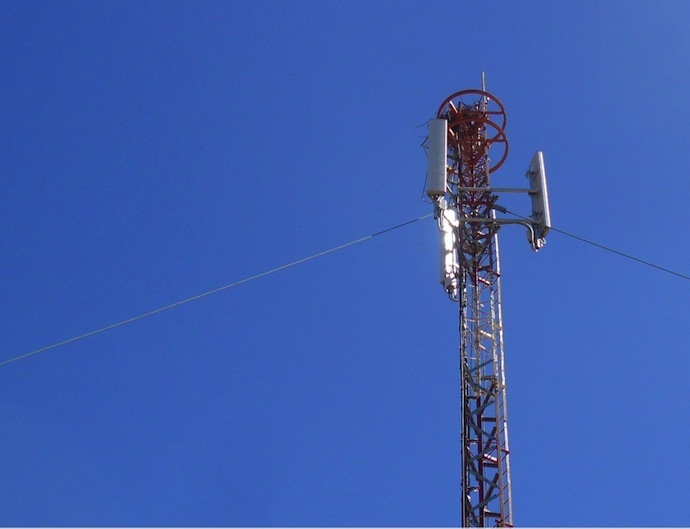 Apparently, the tower in Julie’s original photo was actually a Telstra (850 Mhz) tower and the Optus tower was located to the right (the main image featured in this article). There was a nest on the Optus tower but because it was above the panels there wasn’t any service degradation. Optus has since been to the site and verified that the site works with a 900Mhz handset. And the eagle wins in this story too. As part of Optus’ commitment to the environment, the welfare of wildlife is taken into consideration and Optus are currently building a new tower for the birds – right next to their current home. All’s well that ends well. Marcus hung up his hat and the case of the Mystery of Bird Tower was closed. I discovered the same issue with my Huawei Ascend Y200G when I visited Tasmania. Worked fine in Launceston, but out where we were staying at Grindlewald there was only patchy service (we had to park on a hill with line of sight to Launceston to get service). A search of the Whirlpool forums gave us the answer – the Huawei was 850/2100 and we need 900/2100 for good service on Optus/iiNet. Since we have now bought a house in that area, we will now also have to buy new mobiles with 900/2100 specs. Here’s a puzzle for you … if Julie is yet to test the borrowed handset when next in Onslow, how can the case be closed? @Jimmy, Because it says twice in the essay that phones have been tested twice in the area and it’s only the older model phones that loose reception, not compatible with the broadcast frequency in that area. It’s a common problem with older phones and newer networks. With your service, do you receive better reception/service if you take the mobile voice/mobile broadband service just outside your house or to different parts inside your house? If that’s the case, it’s likely interference caused by something in the house that we are unable to help with. However if you still can’t get reception out of the house and even closer to the tower than we may be able to lodge a fault with the wholesale service provider. The eagle has chosen the tower because it is probably the highest and most suitable site in the landscape. Surely the best solution is to build a bird platform into the existing towers and above the eagles nest rather than a separate tower which may encourage yet another eagle and pose a threat to the original occupant. Loved the story regarding the Eagle Nest, and the lengths gone to to sort it out, WELL DONE! – BUT it is LANDSDALE (with a D) NOT LANSDALE. Thanks for the pick up Tricia – we’ve updated the article. Glad you enjoyed reading the article. Very interesting story, but thought you should know the spelling has not updated. What type of “eagle” does the nest belong to? Very interesting story. Yes I agree that all such remote towers should include eagle nest platform incorporated – a job for parks and wildlife plus planning authorities before any further constructions. In fact all existing such edifices should be enhanced with a platform to assist our mega predator birdlife which is under stress. The moral of the story is don’t go into the bush with anything other than Telstra. I would jump across to Iinet in a flash if I knew they had the backing of a Telstra network. Please continue to look after our wildlife….it’s appreciated…and not only by the birds and their families but our families too.